Cardcaptor Sakura: Clear Card (カードキャプターさくら クリアカード編, Kādokyaputā Sakura Kuria Kādo-hen) is a Japanese shōjo manga series written and illustrated by the manga group Clamp. It is a sequel to Clamp's manga Cardcaptor Sakura and focuses on Sakura Kinomoto in junior high school. The manga began serialization in Kodansha's Nakayoshi magazine with the July 2016 issue. A 22-episode anime television series adaptation by Madhouse, featuring the cast and staff from the original series, aired from January to June 2018. Sakura Kinomoto is starting junior high school alongside her friends, including Syaoran, who had just returned to Tomoeda. After having a prophetic dream about a mysterious cloaked figure, all of the Sakura Cards turn blank and are rendered completely powerless, thus starting her quest to find out what is wrong. In doing so, Sakura and her friends, along with her guardians and protectors Cerberus and Yue, discover and capture the transparent cards, using the new and much stronger mystical dream key. Eriol, Spinel Sun and Ruby Moon, appear as supporting characters, as does Kaho Mizuki, having returned to England, but continuing to aid Sakura and her protectors from afar. Sakura ends up befriending a transfer student named Akiho Shinomoto and meets her butler and guardian Yuna D. Kaito, from whom Syaoran detects vast amounts of magical power. 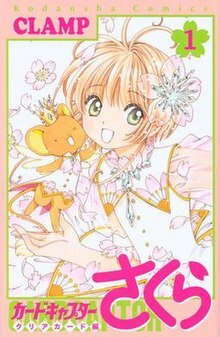 Cardcaptor Sakura: Clear Card is written and illustrated by the manga artist group Clamp. It began serialization in the monthly shōjo (aimed at young girls) manga magazine Nakayoshi with the July 2016 issue sold on June 3. Kodansha Comics is releasing the series in English both digitally and in print. A 22-episode anime television series adaptation aired from January 7 to June 10, 2018 with Morio Asaka, Nanase Ohkawa and Madhouse returning from the original anime series to direct, write and produce the new adaptation, respectively. Kunihiko Hamada replaced Kumiko Takahashi as the character designer from the original series. The main cast from the original anime also returns to reprise their roles. An original video animation prequel titled Sakura and the Two Bears, which bridges the stories of the "Sakura Card Arc" and the "Clear Card Arc", had its world premiere at Anime Expo on July 1, 2017 and shipped in Japan as a DVD bundled with the special edition of volume 3 of the manga on September 13, 2017. The first opening theme for the series is "Clear" by Maaya Sakamoto, while the first ending theme is "Jewelry" by Saori Hayami. Funimation premiered the simuldub on January 24, 2018. The second opening theme is "Rocket Beat" by Kiyono Yasuno while the second ending theme is "Rewind" by Minori Suzuki. The series was released in Japan on Blu-ray and DVD in eight volumes from May to November 2018. Funimation will release a Blu-ray in North America containing the first 11 episodes on February 5, 2019. It was reported in April 2017 that over 1 million copies of the manga were in print in Japan. ^ a b "Crunchyroll Announces Winter 2018 Simulcast License Acquisitions". Crunchyroll. January 8, 2018. Archived from the original on January 31, 2018. Retrieved February 4, 2018. ^ a b c "Cardcaptor Sakura Clear Card Anime Listed With 22 Episodes". Anime News Network. January 28, 2018. Archived from the original on January 29, 2018. Retrieved January 30, 2018. ^ "新連載「カードキャプターさくらクリアカード編」スタート!!" [New series Cardcaptor Sakura: Clear Card Edition Starts!!] (in Japanese). Kodansha. June 3, 2016. Archived from the original on July 4, 2016. Retrieved July 9, 2016. ^ "New Cardcaptor Sakura Manga Is Sequel Launching in June". Anime News Network. April 26, 2016. Archived from the original on April 26, 2016. Retrieved April 26, 2016. ^ "Cardcaptor Sakura: Clear Card Manga Gets Digital English Release With Print Version Listed". Anime News Network. June 30, 2017. Archived from the original on July 1, 2017. Retrieved July 1, 2017. ^ "Cardcaptor Sakura: Clear Card Arc Manga Gets TV Anime Series in January 2018". Anime News Network. November 26, 2016. Archived from the original on November 26, 2016. Retrieved November 26, 2016. ^ "CLAMP's Nanase Ohkawa Writes, Oversees Scripts For New Cardcaptor Sakura Anime". Anime News Network. December 26, 2016. Archived from the original on December 27, 2016. Retrieved December 26, 2016. ^ "New preview video for Cardcaptor Sakura sequel anime avoids Sailor Moon Crystal's missteps【Video】". SoraNews24. September 25, 2017. Archived from the original on January 16, 2018. Retrieved February 16, 2018. ^ "Cardcaptor Sakura: Clear Card Arc Prologue Anime's Promo Video, Story Intro Revealed". Anime News Network. April 1, 2016. Archived from the original on April 2, 2017. Retrieved April 1, 2016. ^ "Anime Expo Holds World Premiere of Cardcaptor Sakura: Clear Card Arc Prologue Anime". Anime News Network. June 6, 2017. Archived from the original on June 27, 2017. Retrieved July 1, 2017. ^ "Maaya Sakamoto Returns to Perform Opening Theme for Card Captor Sakura: Clear Card TV Anime". Anime News Network. September 25, 2017. Archived from the original on September 26, 2017. Retrieved September 25, 2017. ^ "Saori Hayami Performs Ending Theme for Cardcaptor Sakura: Clear Card Anime". Anime News Network. November 28, 2017. Archived from the original on February 13, 2018. Retrieved November 28, 2017. ^ "Cardcaptor Sakura: Clear Card to Simulcast on Crunchyroll & Funimation". Anime UK News. December 1, 2017. Archived from the original on February 19, 2018. Retrieved December 2, 2017. ^ "Cardcaptor Sakura: Clear Card Promo Video Previews New Theme Songs". Anime News Network. March 25, 2018. Archived from the original on June 10, 2018. Retrieved March 25, 2018. ^ "Cardcaptor Sakura: Clear Card Arc Manga's 3rd Volume Bundles Anime DVD in September". Anime News Network. April 1, 2017. Archived from the original on June 22, 2017. Retrieved April 12, 2018.